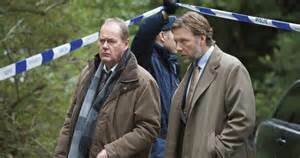 Last night on BBC4 a new Scandi-noir crime series called Martin Beck began much to the delight of many of us who love that genre. I had been looking forwards to this for many days and could not wait for it to start so after chomping down a cheese sandwich I settled in for an hour and a half of great crime fiction. The story starts with a woman lawyer at a motorway petrol station who decides to have a car-wash. Whilst in there a figure from the backseat plunges a syringe into her neck and the scene fades. Not long after a woman and her child are at a playground where the kid hears a sound from beneath the sandpit. And then a knocking. A man was at the playground moments earlier on a swing but hides out. The mother and child run away, leaving the trapped person in the box unable to get out. Cue the next scene where we are introduced to Martin Beck on BBC4 and his team who are called in to investigate the woman in the box who is now dead after being left to suffocate by the mother and her child who got help too late. The victim is the same as the one at the petrol station and it is initially thought that it is linked to a biker gang that the lawyer was waging war against. And then another body in a coffin turns up and another and another with Beck himself becoming a target. I loved it but like many others I do not understand why it has started on episode 26 on season 4 with much of the back story of the characters been missed out on. I found it very poor doing it this way but the BBC do crazy things like this at times. I could tell as well with Beck’s relationship with his team and how he interacted with them as well as his daughter. The killer himself was something from your nightmares and the way in which he killed is most people’s worst nightmare. Other than that I liked it and cannot wait until the next episode. I just hope that a decision is made to show them all in order. Incidentally, these stories are not from the original books but written especially for television although the original books have been turned into films in Sweden. Anyway, as I said, I look forwards to them anyway and see what the BBC does with the rest of them.